What can you do if you had 5 days, 12 painters and 350 litres of paint. 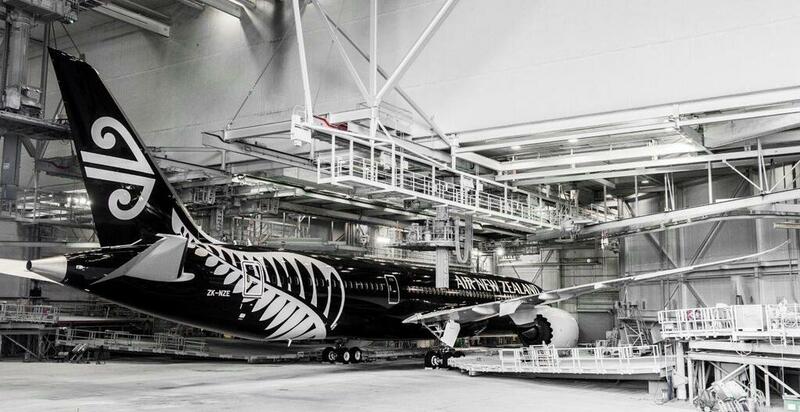 Well, if you are Air New Zealand you could paint your new 787-9 in an ‘All Black’ paint job. Our favourite of the airline’s two new livery designs, this black beauty is well proportioned and striking to look at, With only one other airline (that we know of), Starflyer, offering an all black livery, it certainly will turn heads when it rocks up in Perth from 15 October 2014 and to both Tokyo and Shanghai from November. The freshly painted frame rolled out of Boeing’s paint hangar on Saturday evening 5th April. 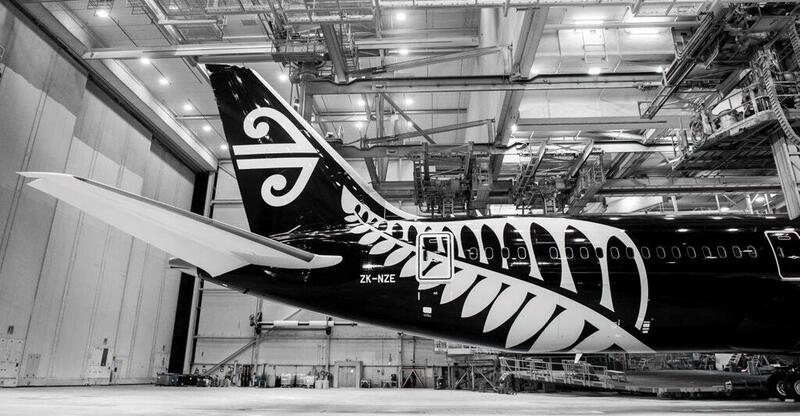 As stated by Air New Zealand, “The 787-9 is the first Air New Zealand aircraft to feature the distinctive black version of the airline’s new-look livery.” The white version of the livery has been gradually rolled out across the airline’s A320 domestic fleet in recent months. Now we still like the designs (above right) by TheDesignAir judge Remy Chevarin, for the white version of the livery, whose taken the Fern mark and carefully incorporated it into a considered final look, without the harsh diagonal break along the fuselage (above left) that ANZ have revealed, but there is no denying that the black bird featured here is both elegant and graceful in appearance. The white nacelles, chrome finishing and black fuselage is an elegant masterpiece and we look forward to not only seeing it in the skies, but flying on it in the near future. Well done ANZ, and well done Boeing, for producing such a fine looking bird. This aircraft (ZK-NZE) is the first of ten 787-9 Dreamliners to join Air New Zealand’s fleet. Air New Zealand is the global launch customer for the 787-9 which is 20 percent more fuel efficient than the aircraft it’s replacing. The 787-9 will first operate the Auckland – Perth route from 15 October 2014. Why not take a look at what is offer inside the new Air New Zealand 787 here. I totally agree…why not follow the natural line of the silver fern to delineate betwen white and black? Personally, I wish they would go back to the original KORU on the tail (its more crisp) and change their font to something a bit more dramatic. I also wish they could incorporate some MAORI design as a background element (faint background wash) to add some dimension and texture to the black. Wow! Every expat kiwi who sees one of these beautiful birds overseas will no doubt puff their chests out some & maybe walk a little taller! Well done ANZ!! !